George Wythe represented the best of the Revolutionary-era Virginia gentry. Wythe, as a law professor, instructed and inspired many of the leading lights of the Patriot movement, including Thomas Jefferson. Wythe was also a racial liberal. After his wife’s death he freed the family’s slaves and even went as far as to adopt and pay for the education of one of their number, a young man named Michael Brown. By the opening years of the nineteenth century Wythe served as chancellor of Virginia’s court of equity where he handed down a monumental decision in the case of Wright v. Hudgins, which held that the burden of proof in cases of runaway slaves rested with the enslaver – not the accused runaway. Wythe and Brown, in the early summer of 1806, were murdered by poison as they shared their morning cups of coffee. The culprit, surprising the expectation of Wythe’s fellow white gentry, proved not to be a slave or free African-American. Instead, Wythe was murdered by George Wythe Sweeney – his grasping, resentful white grandnephew. Sweeney eventually escaped the noose for his crime, for the only witness was a free woman of color who was forbidden by Virginia law from testifying. This anecdote, narrated by Alan Taylor in his most recent book The Internal Enemy: Slavery and War in Virginia, 1772-1832, tells us all we need to about post-Revolutionary Virginia. The real threat to the stability and social structure of the Old Dominion was not racial liberals, like Wythe, free blacks, like Brown, or enslaved African-Americans. The real problem was the rising post-Revolutionary generation of whites – economically and political ambitious, jealous of their honor and white privilege, and dreaming bloody fantasies rebuilding an economically stagnant society. Taylor’s Internal Enemy is a fantastic and cutting edge examination of post-Revolutionary Virginia. Taylor leverages to good use the recent scholarship which has shed new light on the ways in which Virginia’s failed experiment with voluntary manumission strengthened rather than weakened slavery, the deep generational rifts within the white gentry of the early national Old Dominion, the importance of anti-slavery sentiment to the transformation of the British Empire after the American Revolution, and powerful role the War of 1812 played in reshaping the politics of slavery in the United States. In many ways, of course, Internal Enemy is also a Southern excursion of his previous project on the War of 1812. This book gets to a question that I have puzzled over since I began exploring the history of the Old Dominion: why did Virginia’s gentry steadily retreat from national leadership over the course of the early republic? How did the Old Dominion go from producing national leaders like Jefferson and Madison to arch-secessionists like Edmund Ruffin? Taylor explains this story by narrating the tortured relationship between Virginia planters and their “internal enemy,” the Commonwealth’s African-American population – both enslaved and free. By steadily embracing slavery over the course of the eighteenth-century Virginians may have solved the ideological problem of poverty and republicanism, by permanently enslaving their working class, this solution hardly allowed them to sleep soundly. The planter class constantly stressed over their possibly deadly “internal enemy” – bloody slave revolts haunted their waking and dreaming hours. Dunmore and the Revolutionary War highlighted the opportunities the possibility of outside allies provided for enslaved Virginians but it was really the War of 1812 which brought these nightmares into bloody reality. Several thousand slaves escaped Virginia and Maryland during the Chesapeake campaign of the War of 1812 and roughly 400 returned in red-coats as Colonial Marines. These black troops aided the British in raiding costal settlements, burning Washington, and laying siege to Baltimore. They repeatedly returned to plantations to aid friends and family in stealing away into the night to freedom upon British warships. White Virginians, with their poorly trained and equipped militia, repeatedly proved unable to do anything about this. To compound the Old Dominion’s troubles the national government was utterly incapable of protecting them from such ravages – despite the fact that this government was controlled by good Virginia Republicans like Madison and Monroe. White slave-owners, by the end of the War of 1812, understood their predicament. Their slave society had largely only been saved by the fact that the British Navy’s Chesapeake squadron remained relatively small and the imperial government refused to completely transform their forces into an army-of-liberation. The Missouri Crisis, occurring not too long after the War’s end, further darkened the political horizons of Virginia’s gentry. They now understood that they faced two “internal enemies” – in the bodies and agency of enslaved African-Americans within Virginia and from the growing Northern ant-slavery politics within the national union. This dual threat caused Virginia’s political leadership to increasing turn from their traditional allies within the Mid-Atlantic states and towards their fellow Southerners, who truly understood the threats the Old Dominion faced. Taylor presents all of this in a powerfully argued, well-written, and accessible narrative. The Internal Enemy is a triumph of the possibilities of academically rigorous popular history. This is not to suggest, however, that Taylor’s assessment of post-Revolutionary Virginia is not without its flaws. Taylor rightly foregrounds, within his narrative, the complex master-slave relationship, the varieties of slave resistance and agency, and the dysfunctional nature of the white Virginia gentry. One cannot help but wonder, however, how this society actually functioned despite it all. Common white Virginias, a central component of how the Old Dominion’s slave society survived until the Civil War, receive short-shrift in the narrative presented in The Internal Enemies. The same is true for the growth of the evangelical Christianity which increasingly served, for better and worse, as the glue which held black and white Virginia together. As well-described as Taylor’s vision of the Virginia plantation is, his readers would have benefited from him widening out his analytic frame in a few places – to give them the fuller impression of how the entirety of Virginia society functioned in the early republic. Nat Turner’s famous rebellion fits awkwardly within Taylor’s narrative. He devotes a scant three paragraphs directly to the rebellion itself and this leaves one with more questions than answers as to how this most famous example of Virginia slave rebellion works within Taylor’s analysis. Does Turner’s revolt grow out of the experience of armed resistance developed by some African-Americans during the War of 1812? Or did it grow out of the hardening of attitudes towards slavery and the enslavement within Virginia in the wake of peace with British? Is it something else entirely? There are few answers to these tantalizing possibilities within the text itself. These are but minor blemishes upon the scholarly edifice Alan Taylor has constructed in The Internal Enemy. This is a book that deserves a place in seminar rooms, upon nightstands, and on examination lists. The Internal Enemy is, as if we needed it, further testimony as to why Taylor was selected to be Peter Onuf’s successor as Thomas Jefferson Professor of History at UVA. 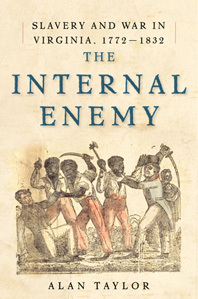 For this story, see Alan Taylor, The Internal Enemy: Slavery and War in Virginia, 1772-1832 (New York: W.W. Norton & Company, 2013), 104-106. See: Eva Sheppard Wolf, Race and Liberty in the New Nation: Emancipation in Virginia from the Revolution to Nat Turner’s Rebellion (Baton Rouge: Louisiana State University Press, 2006); Philip Hamilton, The Making and Unmaking of a Revolutionary Family: The Tuckers of Virginia, 1752-1830 (Charlottesville: University of Virginia Press, 2003); Christopher Leslie Brown, Moral Capital: The Foundations of British Abolitionism (Chapel Hill: University of North Carolina Press, 2006); Matthew Mason, Slavery & Politics in the Early American Republic (Chapel Hill: University of North Carolina Press, 2006). Alan Taylor, The Civil War of 1812: American Citizens, British Subjects, Irish Rebels, and Indian Allies (New York: Knopf, 2010). White Virginians of all classes, even slave-owning planters, constantly resisted and resented militia service. They were needed at home to harvest and protect their families from “the internal enemy.” Militiamen from the upcountry Piedmont and Appalachian areas also had the horrifying tendency to die in the swampy southern Chesapeake. On Missouri, see Taylor, The Internal Enemy, 404-409. In particular, see Ibid., 215-243. For a nuanced treatment of the complex master-slave relationship, see Taylor’s treatment of surviving correspondence between African-Americans who escaped to freedom during the War of 1812 and their former enslavers, 381-387. Taylor’s account of the place within the Old Dominion of the post-voluntary emancipation free African-American community is similarly underdeveloped. For a powerful treatment of this issue see: Randolph Ferguson Scully, Religion and the Making of Nat Turner’s Virginia: Baptist Community and Conflict, 1740-1840 (Charlottesville: University of Virginia Press, 2008). See also Charles F. Irons, The Origins of Pro-Slavery Christianity: White and Black Evangelicals in Colonial and Antebellum Virginia (Chapel Hill: University of North Carolina Press, 2008). See Taylor, The Internal Enemy, 414-415. These questions are particularly interesting because Taylor, rightly, celebrates (sometimes violent) slave resistance throughout the text. From work slowdowns, “leaving off,” flight into the night, to joining the Colonial Marines slave resistance is deeply explored throughout The Internal Enemy. Even the “Matthews County scare” preceding Turner’s rebellion receives a full treatment. Taylor only describes the Rebellion as “indiscriminate murder” and “distorting prism for interpreting slave resistance in Virginia.” By this I believe he means that murder of whites was very uncommon in slave resistance in the Old Dominion. This is absolutely true but I wish Taylor had more fully explored if the changes in Virginia slavery he narrates impacted what made the Turner Rebellion different. It is a real missed opportunity. See Ibid., 415. Thanks, Roy. I’m anxious to read this.